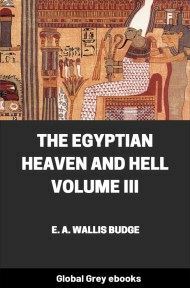 This is Volume 3 of E. A. Wallis Budge's Egyptian Heaven and Hell trilogy. Subtitled 'The Contents Of The Books Of The Other World Described And Compared'. 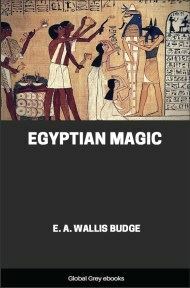 THE inhabitants of Egypt during the Dynastic Period of their history possessed, in common with other peoples of similar antiquity, very definite ideas about the abode of departed spirits, but few, if any, ancient nations caused their beliefs about the situation and form, and divisions, and inhabitants of their Heaven and Hell, or "Other World," to be described so fully in writing, and none have illustrated the written descriptions of their beliefs so copiously with pictorial representations of the gods and devils, and the good and evil spirits and other beings, who were supposed to exist in the kingdom of the dead. 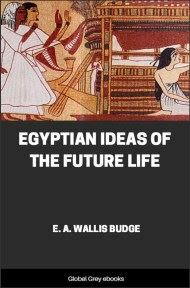 It is now generally admitted that Egyptian Dynastic History covers a period of nearly five thousand years, but it must not be assumed for one moment that it is at present possible to describe in a connected or complete form all the views and opinions about their Other World which were held by the theologians and the uneducated classes of Egypt during this long space of time, and it must be said at once that the materials for such a work are not forthcoming. 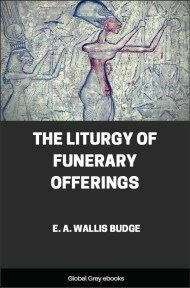 All that can be done is to collect from the copies that have come down to us of the books which relate to the state and condition of the dead, and to the abode of departed spirits, the beliefs which are enunciated or referred to therein, and, taking them so far as possible in chronological order, to piece them together and then make deductions and draw general conclusions from them. We must always remember that the texts of the various Books of the Dead are far older than the illustrations found in the later recensions of them which are now in our hands, and that such illustrations, in matters of detail at least, reflect the opinions of the priestly class that held religious supremacy at the time when they were drawn or painted. In cases where archetypes were available the artist was careful to follow in all general matters the ancient copies to which he had access, but when new beliefs and new religious conceptions had to be illustrated, he was free to treat them pictorially according to his own knowledge, and according to the wishes of those who employed him. 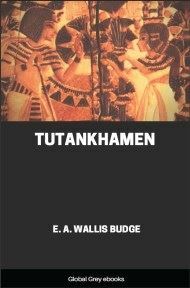 The oldest Books of the Dead known to us, that is to say, the religious compositions which are inscribed on the walls of the chambers and corridors of the pyramids of kings Unas, Teta, Pepi I., Mer-en-Ra, and Pepi II., are without illustrations of any sort or kind, and it is not easy to account for this fact. That the Egyptians possessed artistic skill sufficient to illustrate the religious and general works which their theologians wrote or revised, under their earliest dynasties of kings of all Egypt, is evident from the plain and coloured bas-reliefs which adorn the walls of their mastabas, or bench-shaped tombs, and we can only point out and wonder at the fact that the royal pyramids contain neither painted nor sculptured vignettes, especially as pictures are much needed to break the monotony of the hundreds of lines of large hieroglyphics, painted in a bluish-green colour, which must have dazzled the eyes even of an Egyptian. The reason, however, why such early texts are not illustrated is probably not far to seek. 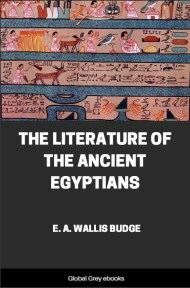 Professor Maspero has proved that the "pyramid texts" contain formulae and paragraphs which, judging from the grammatical forms that occur in them, it is easy to see must have been composed, if not actually written down, in the earliest times of Egyptian civilization. These formulae, &c., are interspersed with others of later periods, and it seems as if, at the time when the "pyramid texts" were cut into stone, these religious compositions were intended to contain expressions of pious thought about the hereafter which would satisfy both those who accepted the ancient indigenous beliefs, and those who were prepared to believe the doctrines which had been promulgated by the priests of the famous brotherhood of Ra, the Sun-god, who had made their head-quarters in Egypt at Annu, i.e., On, or Heliopolis. The old native beliefs of the country were of a more material character than the doctrines which the priests of Heliopolis taught, but it was found impossible to eradicate them from the minds of the people, and the priests therefore framed religious works in such a manner that they might be acceptable both to those who believed in the old animal-gods, tree-gods, plant-gods, &c., of Egypt, and those who preferred a purely solar cult, such as that of the worship of the Sun-god Ra. The oldest Books of the Dead, in fact, represent the compromise arrived at under the IVth, Vth, and VIth Dynasties, between the priests of the old and the new religions. This being so, the religious texts of the period represent too much a patch-work belief for purposes of systematic illustration, and in the result, and perhaps also through the funeral customs of the day, the growth in men's minds of the wish for illustrated guides to the Underworld was retarded. When the glory of sovereignty departed from the kings who held court at Memphis after the end of the rule of the VIth Dynasty, the system of solar theology, which had been promulgated in Lower Egypt by the priests of Heliopolis, began to make its way into Upper Egypt, and wherever it came it assumed a leading position among the religious systems of the day. 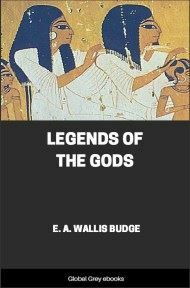 The kings of the VIIth and VIIIth Dynasties, like those of the IIIrd, IVth, and VIth, came from Memphis, but they had comparatively little power in the land, and, so far as we know, they did not build for themselves pyramids for tombs, and there is no evidence forthcoming to show that they filled the walls of their sepulchres with religious texts. They carried on neither wars nor building operations of any importance, and it seems that their tombs were neither large nor magnificent.